The iconic French children’s story “Belle and Sebastian” has added a fascinating sub-theme of Jewish refugees fleeing the Nazis into Switzerland during the Second World War in its new film version. Originally entitled Belle et Sébastien in French, it first started life in 1965 as a children’s novel by French film actress and author Cecile Aubry. The book was first adapted into a French TV series in the late 1960s and proved so popular that it was dubbed into English and shown on the BBC in the UK. It even provided the inspiration for the Scottish “indie” band “Belle and Sebastian”. The new film version resets the action to 1943. Set in the French Alps near the French-Swiss border, it tells the story of the friendship between a young French boy and a wild dog, who local villagers suspect of killing their local sheep. As a parallel story, local Nazi soldiers are trying to close down an escape route of Jewish refugees going over the mountains to Switzerland. The film is beautifully shot in the French mountain high country, with excellent acting by Felix Boussuet as the young Sebastian, the experienced Tcheky Karyo as Sebastian’s adopted grandfather and some astonishing Pyrenean Mountain Dogs playing Belle. It’s a warm-hearted story aimed at family viewing (opening here in Australia in time for the winter school holidays), and the adaptation’s addition of the Jewish refugee sub-plot fits neatly into the heroic story of Belle and Sebastian. It’s also a dog-lover’s delight, complete with lots of interesting secondary village characters. “Belle and Sebastian” was the second highest-grossing film in France last year, and premiered in Australia at the French Film Festival in March. The Jewish experience in France is a complicated one: after centuries of persecution, Jews were emancipated during the French Revolution, and Napoleon spread this freedom to Jews in other parts of Europe as he expanded the French empire. Yet it was in France that the Jewish Captain Alfred Dreyfus was falsely accused of treason, and French collaboration with Nazis in persecuting Jews was widespread. Today, with more than half a million Jews living in France, the Jewish contribution to French life and culture continues to be significant. Each year, the French Film Festival provides a window into the latest intersections of Jewish history and French culture. This year two Festival films contain Jewish themes: one on Russian-Jewish refuseniks and one on Jewish refugees fleeing the Nazis into Switzerland. The Festival also features “Grand Central”, a new film by French-Jewish director Rebecca Zlotowski (“Belle Epine”) and a small retrospective of films by Francois Truffaut, who is a significant figure in French Jewish film. Truffaut (1932-84) is not identified as Jewish in the popular mind, but private research in the late 1960s identified his previously unknown father as Jewish. While Truffaut’s mother denied the allegation, Truffaut reportedly embraced it, believing that it explained much of his character and his interest in society’s outcasts and martyrs. But Truffaut’s experience of Jewish life went further: his first wife, Madeleine Morgenstern, was Jewish, as were his two daughters with her – Laura and Eva. More than that, we remember Truffaut for his two classic Jewish films: “Au Revoir Les Enfants” (Goodbye, Children) and “The Last Metro”. While neither of these films are included in the retrospective, the Festival does feature “Finally, Sunday”, “Jules and Jim” and his autobiographical “The 400 Blows”. Despite its inherent human drama during a heightened time of Cold War tension, there are remarkably few filmic portrayals of the experience of Soviet Jews during the Brezhnev “refusenik” period, when many Jewish attempted, usually without success, to leave Soviet Russia. The Festival features one film that deals with this time – “Friends From France” (“Les Interdits”), directed by Anne Weil and Philippe Kotlarski. Set in 1979, two French Jewish cousins (played by the singer Soko and Jeremie Lippmann) travel to Odessa pretending to be an engaged couple on a holiday. But they are really there to make contact with Soviet-Jewish dissidents. It’s a time of danger and secret police raids. Complications ensue when the cousins become attracted to each other, and the personal and the political become intertwined. The “Belle and Sebastian” story started life in 1965 as a children’s novel by French film actress and author Cecile Aubry. Set in the French Alps, it tells the story of the friendship between a young French boy and a wild dog, who local villagers suspect of killing their local sheep. The book was adapted into a French TV series and then a Japanese animated series. This new film version has been re-set in 1943 and moved to the French-Swiss border, with an additional theme of local Nazi soldiers who are trying to close down an escape route of Jewish refugees going over the mountains to Switzerland. It is beautifully filmed in the French mountain high country, with excellent acting by Felix Boussuet as the young Sebastian, the experienced Tcheky Karyo as Sebastian’s adopted grandfather and some astonishing Pyrenean Mountain Dogs playing Belle. It’s a warm-hearted story aimed at family viewing, and the adaptation’s addition of the Jewish refugee sub-plot fits neatly into the heroic story of Belle and Sebastian. It’s also a dog-lover’s delight, complete with lots of interesting secondary village characters. The French Film Festival’s screenings of “Belle and Sebastian” are the first ones in an English language country, one of many opportunities to see un-released French films. The Festival runs in Sydney from 4 through 23 March and Melbourne from 5 through 23 March. Click here for details on Canberra, Brisbane, Perth, Adelaide and Byron Bay. Generations of film-goers have become used to French films with a distinctly artistic bent: the “nouvelle vague” – “new wave” – films became associated with a casual (some would say careless) approach to telling screen stories. In the late 1950s films of Truffaut, Chabrol and Goddard, we became accustomed to listen to “the white spaces” between the lines the actors spoke, in between puffs on their ever-present Gauloises. How unlike the “tell them everything” approach that Hollywood film has taken. But times have changed. In fact many of this year’s selection of films at the Alliance Francaise French Film Festival (from 5 March in Sydney; 6 March in Melbourne; later in other states) seem peculiarly, in fact almost adamantly, American in theme and approach. Of the films in the Festival with significant Jewish interest, three of them feel like American re-makes, and two of them actually are. 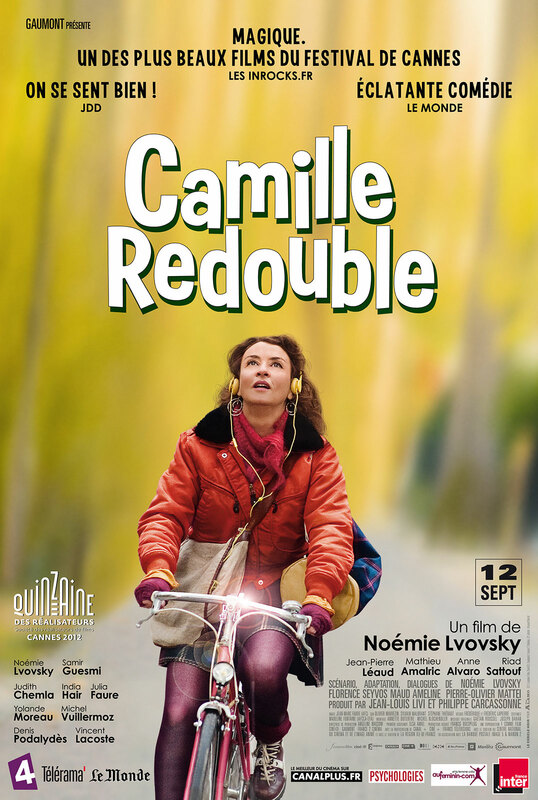 In “Camille Rewinds”, French-Jewish Noemie Lvovsky directs, co-writes and stars as Camille, an unhappy, about-to-be divorced woman (think Kathleen Turner in “Peggy Sue Got Married”). At a New Year’s Eve party, she faints and travels back in time to her sixteen year-old high school past when she first met her husband. She magically slips into her past life, but this time knows the future consequences of her actions and tries hard to avoid them. It’s a light, romantic fantasy, marred only by Lvovsky’s casting herself as Camille: the somewhat rotund Lvovksy does not look anything close to sixteen, and she has cast two actors as her parents who look nothing like her distinctly Ashkenazic Jewish features. Another Jewish actor – noted writer/director Mathieu Kassovitz – stars in “Another Woman’s Life”. In their twenties, young Marie (a delightful Juliette Binoche) meets and falls in love with Paul (Kassovitz), but wakes up to discover that she and Paul have been married for ten years. Worse yet, they are on the verge of divorce, both in relationships with other people. Like Nicolas Cage and Tea Leoni in “The Family Man”, can Marie save her marriage – the one she cannot remember even having? In “Happiness Never Comes Alone”, popular Moroccan-Jewish actor and comedian Gad Elmaleh plays a French-Jewish musician Sacha. He falls in love with Charlotte (played by a very radiant Sophie Marceau), a woman with two former husbands, three children and a busy professional life. Will these two lovers overcome their challenges and achieve a happy life together? Yet another truly American-style story of individuals triumphing over adversity, enlivened by the bursting energy that the two leads bring to the screen. Sacha’s grandmother has the best funny Jewish lines, with her first “is she Jewish?” question, and her telling Sacha to check Charlotte’s sons at night to see if they are circumcised. Rounding out the films of related Jewish interest are an historic drama and a powerful documentary. The closing night film “Les Enfants du Paradis” is an epic made in Paris during the final years of the Nazi occupation: many view this classic as the best French film ever made. And in “The Invisibles”, gay French-Jewish documentarian Sebastien Lifshitz looks at homosexual men and women born during the period 1919 to 1939, a time when they were forced to become “invisible”. You are currently browsing the archives for the French film category.